Scotland should be able to decide what time it goes to bed at night free of diktats from Westminster, according to Scottish First Minister Nicola Sturgeon. 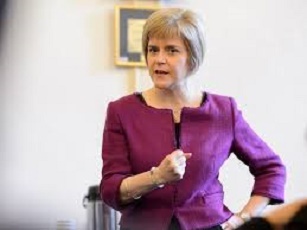 Speaking at the Edinburgh Television Festival, Ms Sturgeon said that Scotland’s strict bed time routine orchestrated by Westminster politicians meant that many Scots, having had by law to get into their pyjamas and clean their teeth before turning in for the night, often ended up missing huge chunks of their favourite scheduled films such as Braveheart and the Wicker Man. “It’s so unfair. We get to watch the boring bits at the start but then have to be tucked up before the end, whilst England, Wales and Northern Ireland are all staying up watching Edward Woodward being dragged into the wicker man and shouting nooo! !” She bemoaned. Prime Minister David Cameron has ruled out any amendments to present Scottish bed time legislation. “Scotland is already allowed to decide what time it goes to bed, under the strict proviso that it is no later than midnight. Unfortunately Scotland already pushes this to the limit and frequently stays up right until 12am on the dot, and that is why it is so irritable and cranky.” He explained.